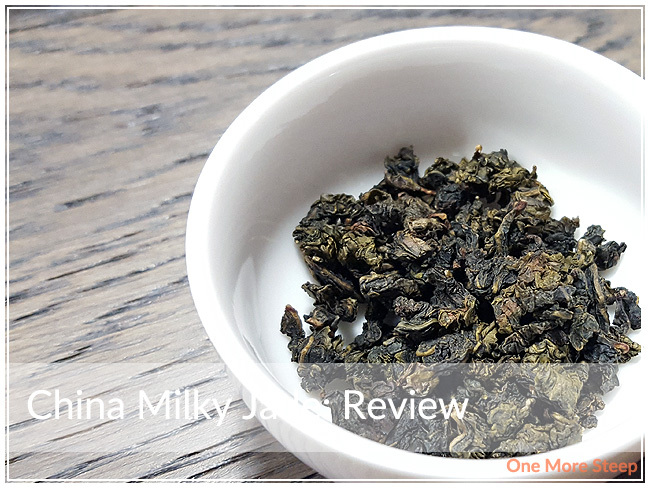 TeaHaus has provided me with China Milky Jade for the purposes of providing an honest review. I received this product at no charge to me and received no other compensation. China Milky Jade is TeaHaus’s milk oolong. 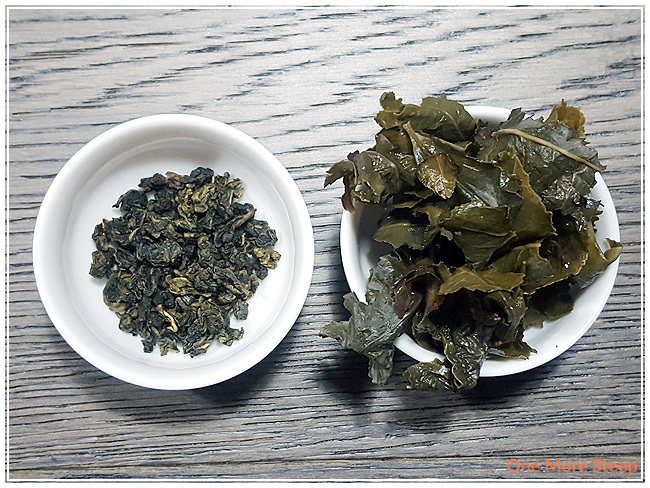 Described as “premium oolong classic”, milk oolong is produced by infusing it the tea leaves with milk flavor (and, from the description on the sample label, done via a steam bath). China Milky Jade has a very nice aroma to it – very milky, creamy, almost a hint of butter. But mostly it’s the milk and cream qualities that shine through in this tea when I opened up the bag. There’s a soft floral scent to the tea as well, but the hints of flowers take a backseat to the milk aroma in this oolong. China Milky Jade is an oolong tea with milk flavouring infused to it via the process of tea production. TeaHaus recommends steeping China Milky Jade in 90°C (194°F) water for 2 minutes. My initial steep of China Milky Jade was in 90°C water for 2 minutes. China Milky Jade steeps to a pale yellow for the initial steep. The aroma of milk is very fragrant in this tea. This milk oolong is very smooth with no bitterness or astringency to note. 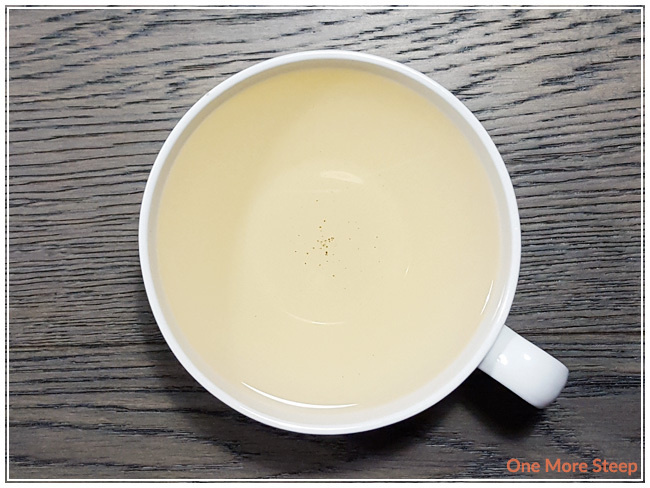 I quite enjoyed the milk flavour of this oolong – it’s got a lovely smooth texture, and has a buttery taste from the cream/milk flavours. There are some mild floral notes to this tea, but I find that the dairy is more prominent in comparison. The floral flavours of this oolong add just a hint of sweetness, but it’s not the most obvious flavour of this tea. I love resteeping oolong because they generally do very well. China Milky Jade did not disappoint. On subsequent resteeps, I add an additional 30 seconds per steep and the tea comes out a brighter, more vibrant shade of yellow. In total, I resteeped China Milky Jade a total of nine times (ten steeps overall). I found as I got further in, the dairy notes begin to fade and the light floral sweetness comes out more and more. I would say this oolong did get to be a bit watered down by the seventh resteep (eighth overall steep), but it’s still got a hint of flavour. 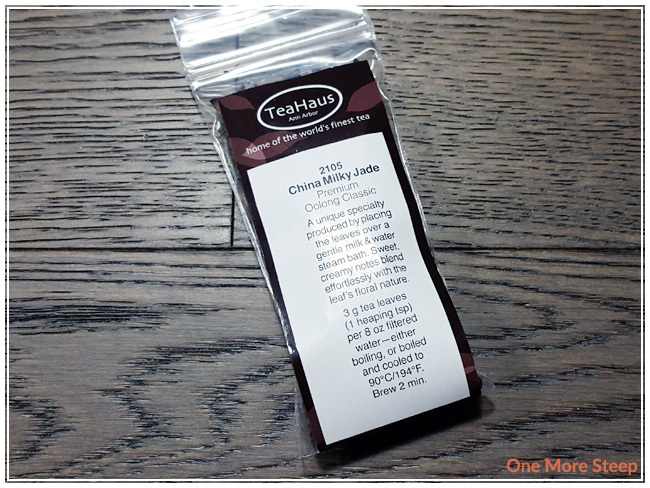 I loved TeaHaus’s China Milky Jade. I was very impressed with how well China Milky Jade resteeped. It’s a delicious oolong with great dairy flavouring to it. I found that the subtle switch in the flavour profile to be delicious as it began to be less dairy and more floral. The leaves opened up tremendously and it was a great tea to enjoy. This is definitely a tea that deserves the time to be steeped again and again. I feel this tea would go well with both sweets and savoury dishes because of the milky and floral flavours.